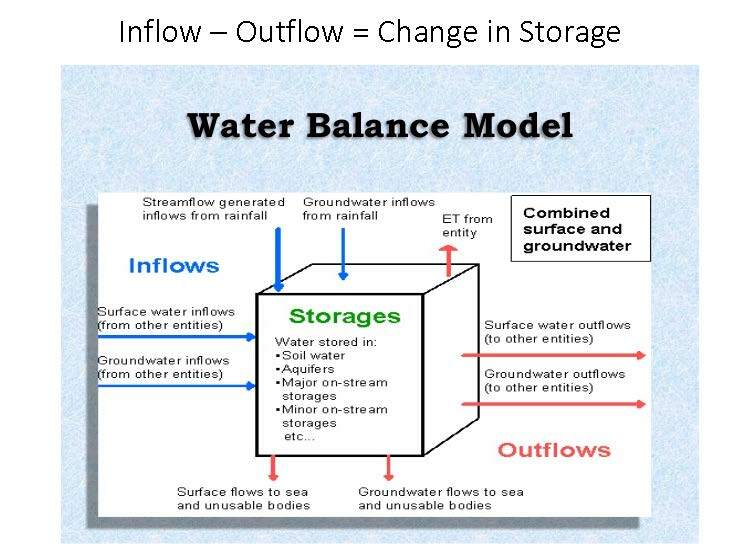 With the deadline to form groundwater sustainability agencies looming just weeks in the future, at the April meeting of the California Water Commission, commissioners heard from three groundwater managers about how implementation of the Sustainable Groundwater Management Act is playing out in their respective regions. 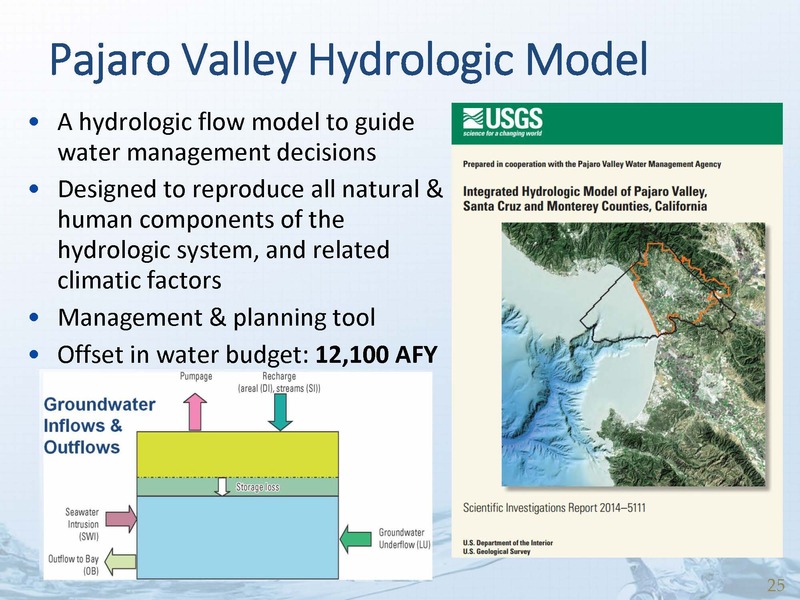 The first presenter was Brian Lockwood, interim General Manager of the Pajaro Valley Water Management Agency. He has served as a technical lead for programs related to ground water, hydrologic modeling, managed aquifer recharge, recycled water use, sea water intrusion and water conservation. 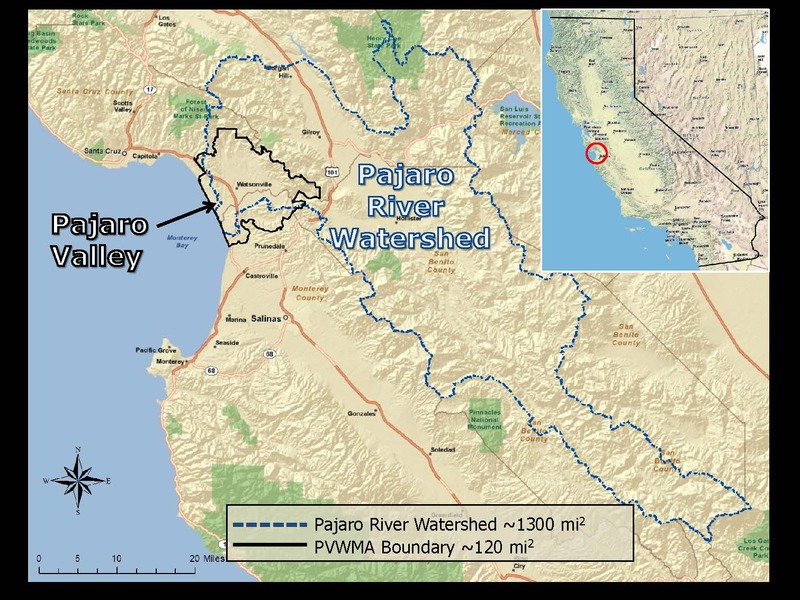 The Pajaro Valley Water Management Agency was formed in 1984 to provide water management for the Pajaro Valley. The agency’s jurisdiction includes the City of Watsonville and parts of Santa Cruz, Monterey and San Benito Counties. Their activities include basin management planning, well metering, hydrologic monitoring, supplemental water creation and delivery, and conservation programs. 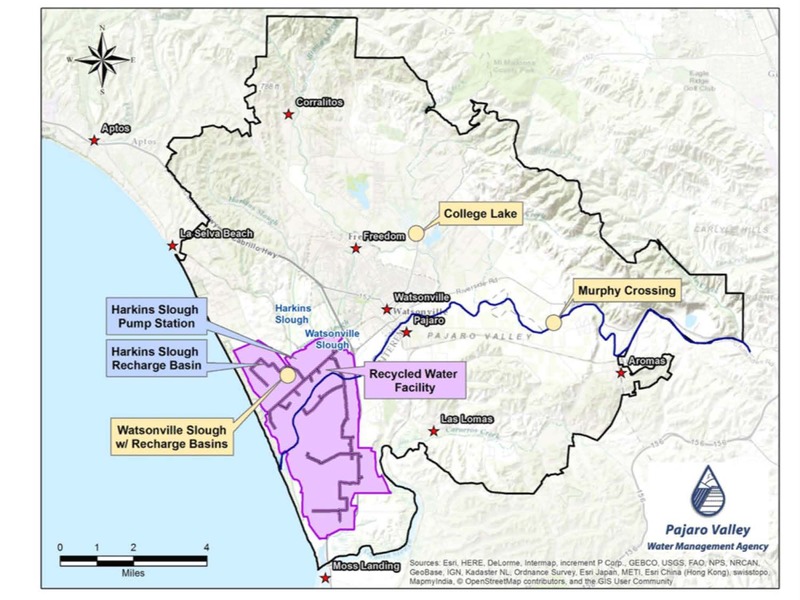 The agency’s jurisdiction is the area at the end of the Pajaro River watershed; the watershed is depicted in the blue line and the statutory boundaries of the agency is depicted by the black line. The agency is governed by a seven-member board of directors; four are elected and three are appointed. “Our board has really been proactive, forward thinking and progressive in their policy setting to allow us to do the things that we’ve been doing to manage the basin,” he said. For the last thirty-plus years, agency staff has been collecting data on surface water, ground water, supplemental water supplies, and land use; this data feeds into the models, reports, and basin management. 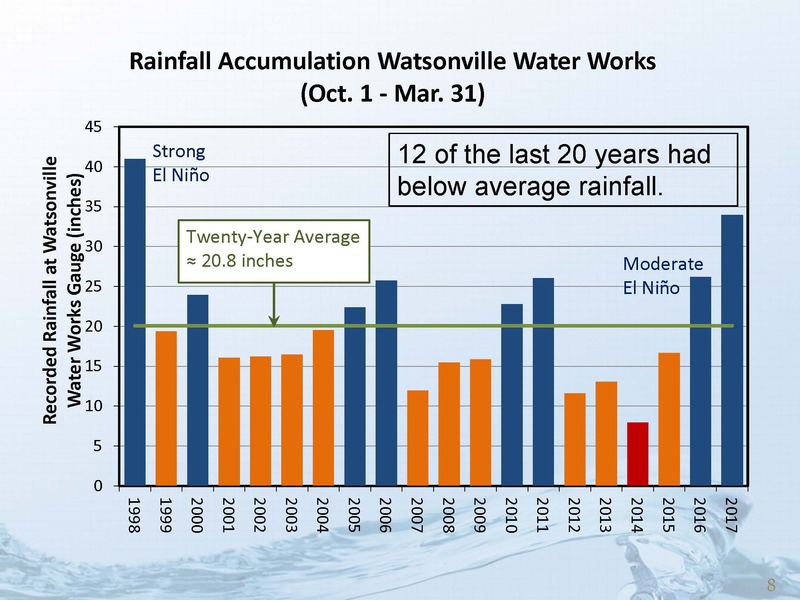 The rainfall in the Pajaro Valley averages about 21 inches a year; 12 of the last 20 years have been below average. 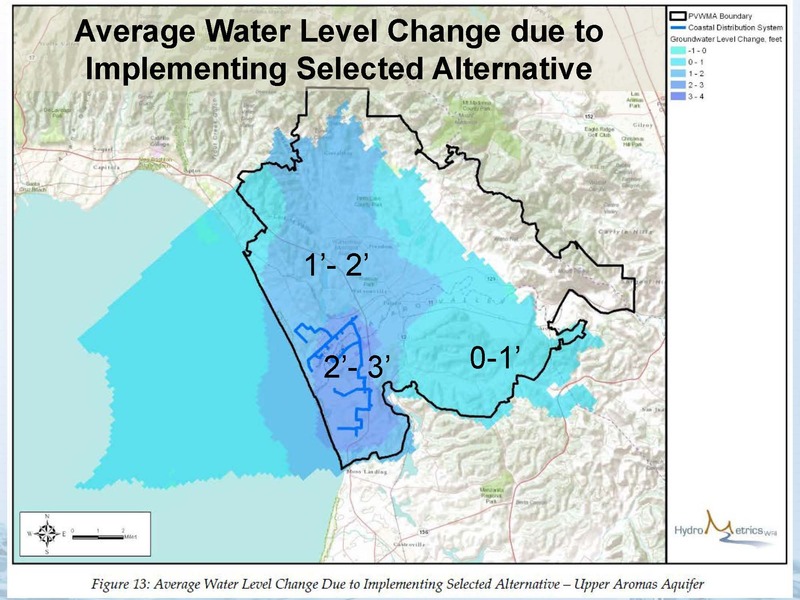 “In many years we may not get enough rainfall to induce deep percolation; we know that we need about 16 or more inches to deep percolation to get rainfall into the aquifers,” said Mr. Lockwood. 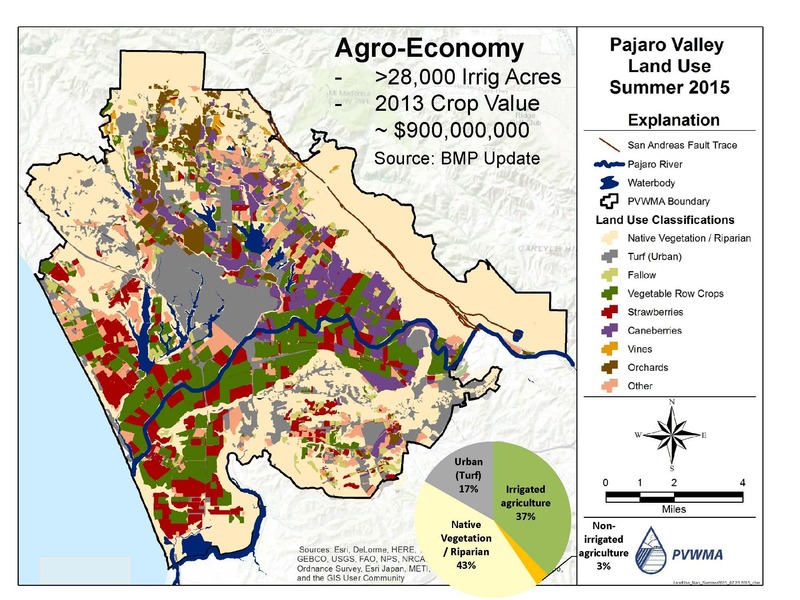 The agency does land use mapping annually; the map shows the distribution of irrigated agriculture which accounts for about 37% of the land in the valley. About 28,000 irrigated acres produces little over $900 million a year of high value fruit, vegetable, and cut flower crops. These include vegetables, strawberries, blackberries, and raspberries. 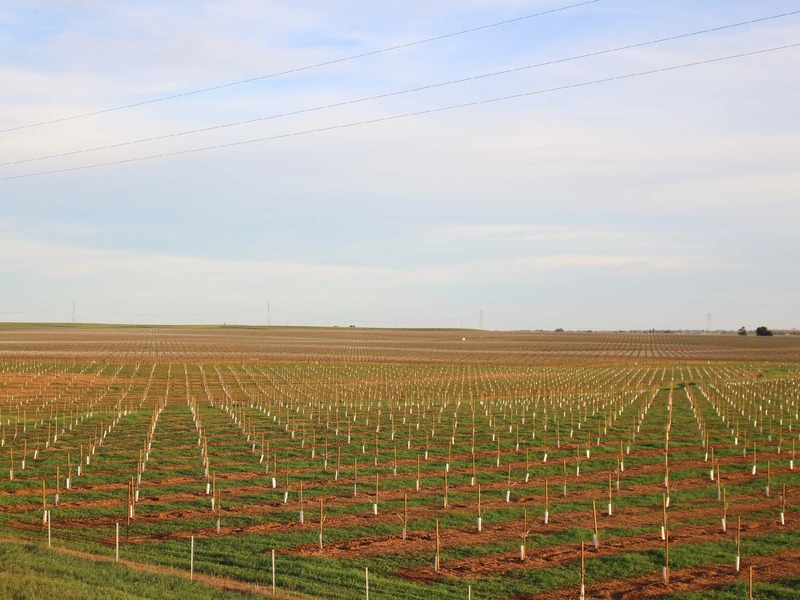 The valley was dominated by apples in the 40s; changing land use and changing crop types has led to increase water demand but also to higher value crops. Virtually all water use comes from groundwater; 1% comes from surface water and another 1% from recycled water. There are about 2,000 wells within the agency’s service area. All of the wells are metered except for domestic wells. 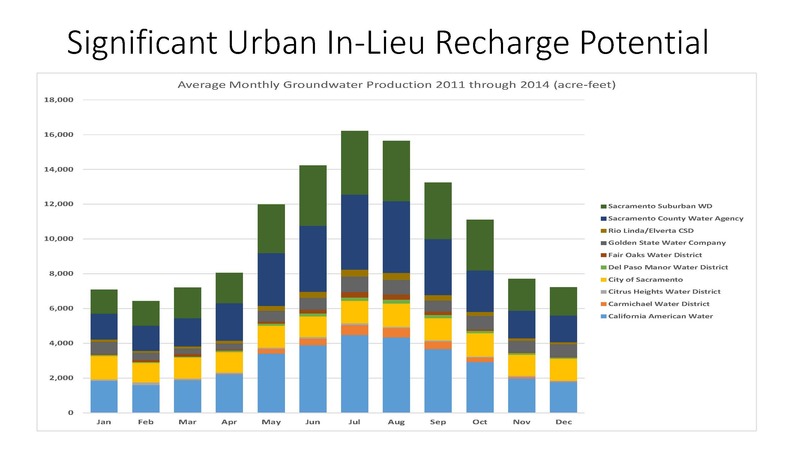 On the bar graph, dark blue shows metered production for agriculture; light blue is the household water use; the purple bar at the top is the supplemental water supply facility; the green bar is rainfall. From the spring of 2011 to the spring of 2015, water levels throughout the valley declined by about six feet, or about one and half feet per year over the drought. However, from the fall of 2015 to the fall of 2016, they got about a foot of recovery, and early indications for this year show possibly two or more feet of recovery after the exceptional wet winter the state has had. Mr. Lockwood then presented groundwater contour maps showing the groundwater surface elevations in the fall of 2013 and the fall of 2016. He noted that it’s a two-dimensional representation of what is really a three-dimensional reality, so there’s a lot of simplifications in the map. “We have a stacked aquifer system and so each aquifer sometimes has the potential at least for a different water level,” he said. 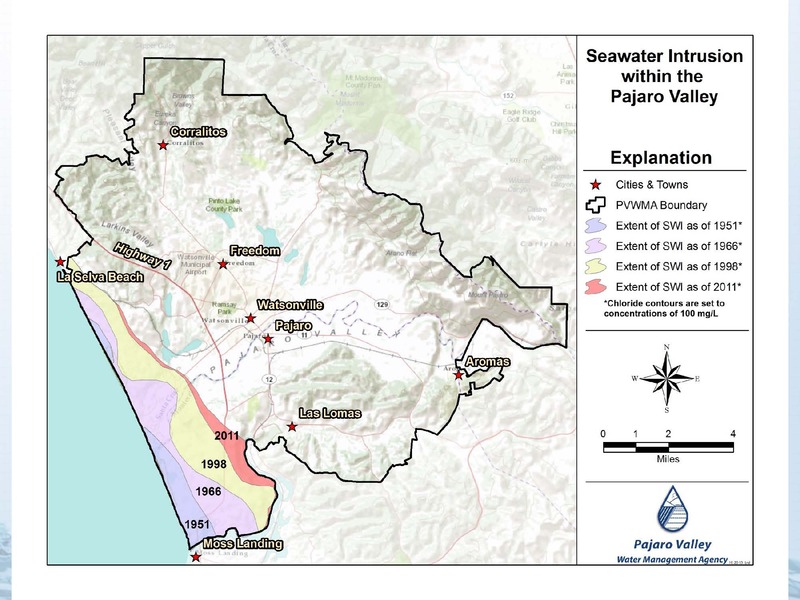 Mr. Lockwood noted that they have seen some recovery; the areas which have recovered the most are those that are near the Pajaro River and in the areas where their water supply facilities are delivering water that serves as in-lieu recharge. He next presented a map of seawater intrusion, noting that the map illustrates a chloride concentration of 100 parts per million which shows the inland migration through time which has drastically slowed since the water supply facilities began delivering water. 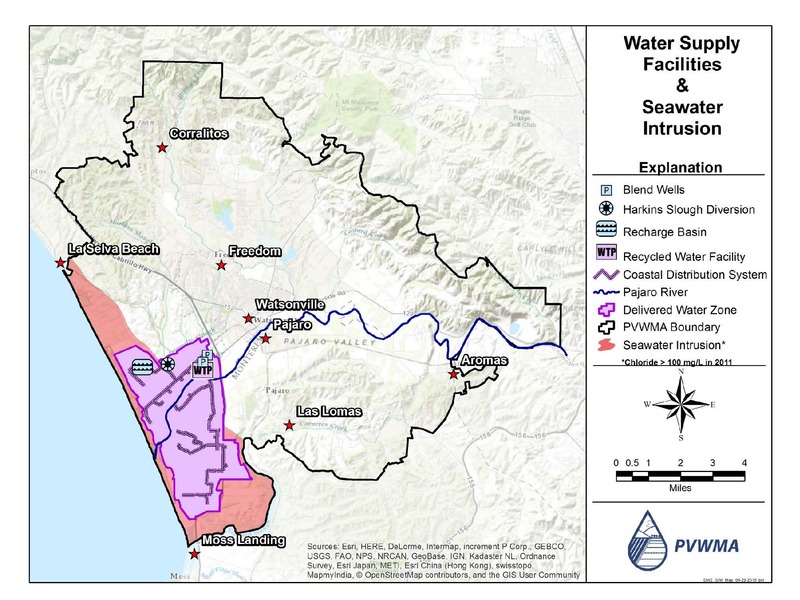 In order to balance the basin and stop sea water intrusion, the agency has supplemental water supply facilities that deliver surface water to the area shown in purple on the map. The facilities include a managed aquifer recharge facility that has recharged 8,000 acre-feet since it was constructed in 2002, and a recycled water facility came online in 2009 with a capacity of producing 4,000 acre-feet per year. The managed aquifer recharge basin is 8 acres and about 25 feet deep; the recharge water comes from winter flows that would otherwise flow into Monterey Bay. An added benefit is that studies by UC Santa Cruz and Stanford have indicated a 50% rate in denitrification from the water that percolates through the first meter of the basin, Mr. Lockwood said. The water recycling facility uses UV light as the disinfectant to meets Title 22 standards before it’s distributed to crops. “We’ve delivered over 11 billion gallons of water since 2002 and those water deliveries have really had an impact on the ground water levels we see in the coastal area,” Mr. Lockwood said. 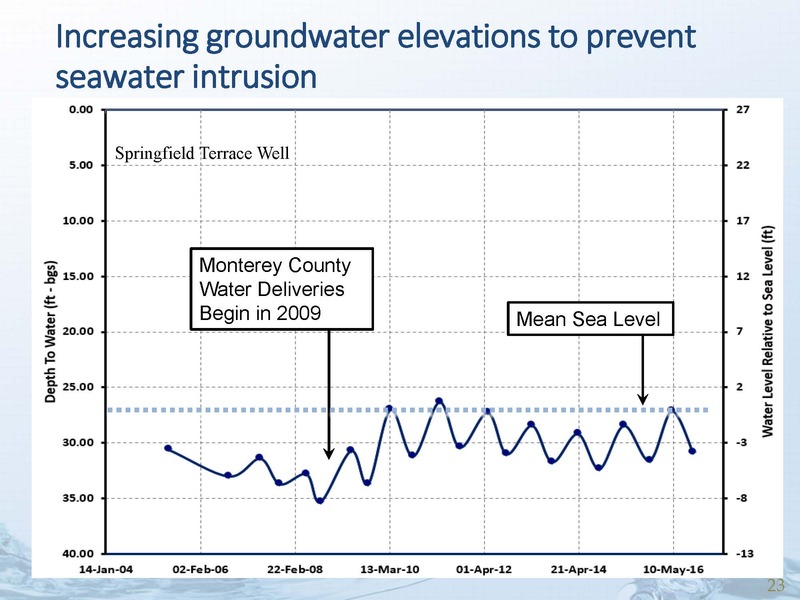 He presented a slide of a hydrograph for a well that shows that the trend was downward, but since water deliveries commenced, the levels have come up over 8 feet. 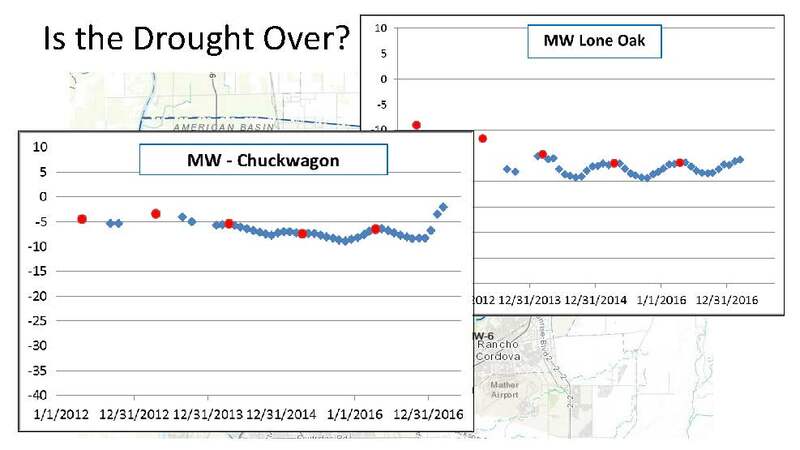 Although water levels did decline as a result of the drought, they did not drop as far as they had been before the agency started delivering water. In 2010, the board formed an ad hoc basin management committee, a 21-member committee with members from the environmental community, the cities, and agricultural interests. The committee met for 2 years, evaluating 44 different projects and programs, eventually narrowing that down to seven which were tested through the model. Mr. Lockwood presented a pie chat that shows a combination of both demand side management and supply side management. “We have an ambitious goal of saving 5,000 acre-feet per year through voluntary conservation programs and then making the balance through supplemental water supply facilities,” he said. 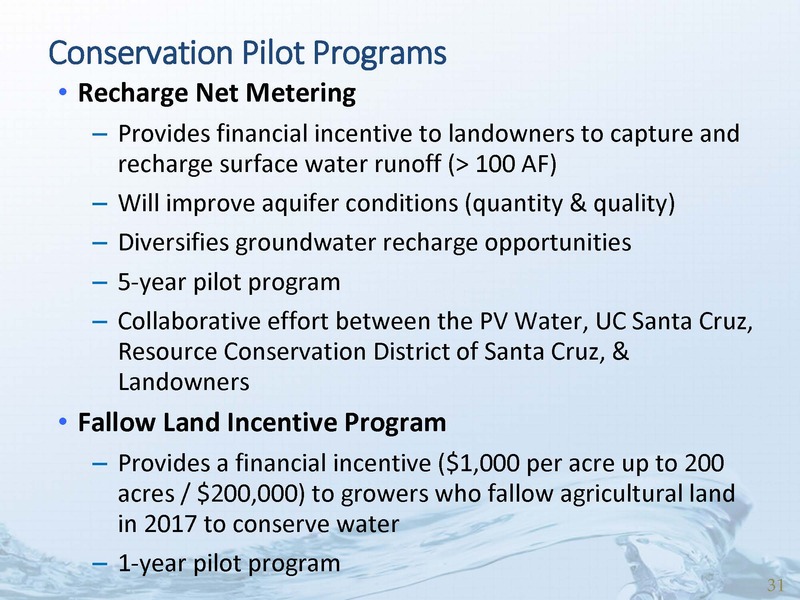 Fallow Land Incentive: This is a one-year pilot program that pays growers up to $1,000 an acre for a total of 200 acres to fallow their land and allow them to track how much water saving occurs. Tim O’Halloran is General Manager of the Yolo County Flood Control and Water Conservation District. For the past 13 years, he and the district have forged a partnership throughout the region to provide reliable and affordable water for the farms and ranches while preserving the natural resources of the Cache Creek Watershed. They have an existing county-wide groundwater model which they are working to further develop to make it more robust; they’ve also been measuring subsidence, so they came from a good starting point. Looking to the future, Yolo County has also undergone a transformation over the last decade into permanent crops, and permits for new wells have gone through the roof. “So while we try to assure people that we’ve been in good shape and we’re in good shape now, the future is uncertain and we need to have serious engagement to deal with the future,” he said. Early on, they made a strategic decision to keep things simple for the general public and let the water wonks deal with the details that included developing a simpler GSA concept model. They developed a JPA model of governance and are now beginning implementation. 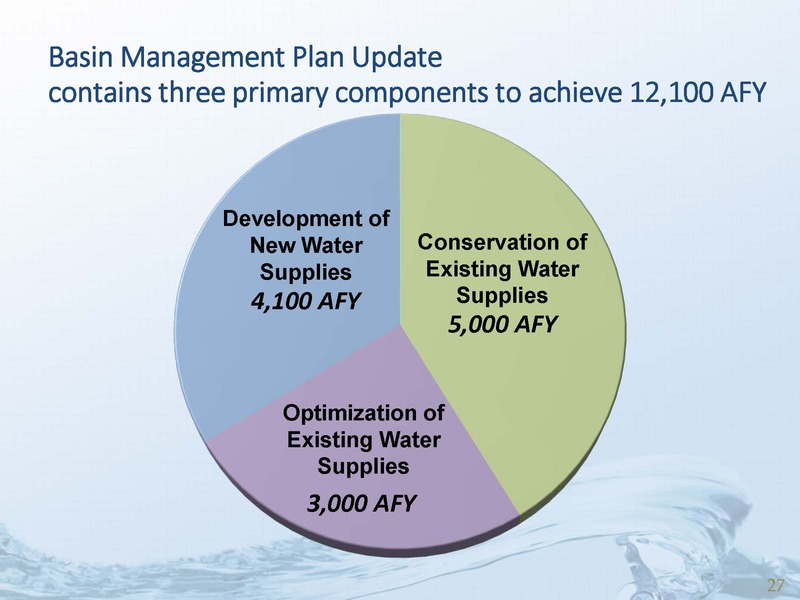 They also requested a basin boundary adjustment to most of Yolo County and it was approved, so they are moving forward with essentially one sub-basin for the whole county. When they started asking people to work together to form one GSA and one GSP over the sub-basin, some wanted to form their own GSA instead. 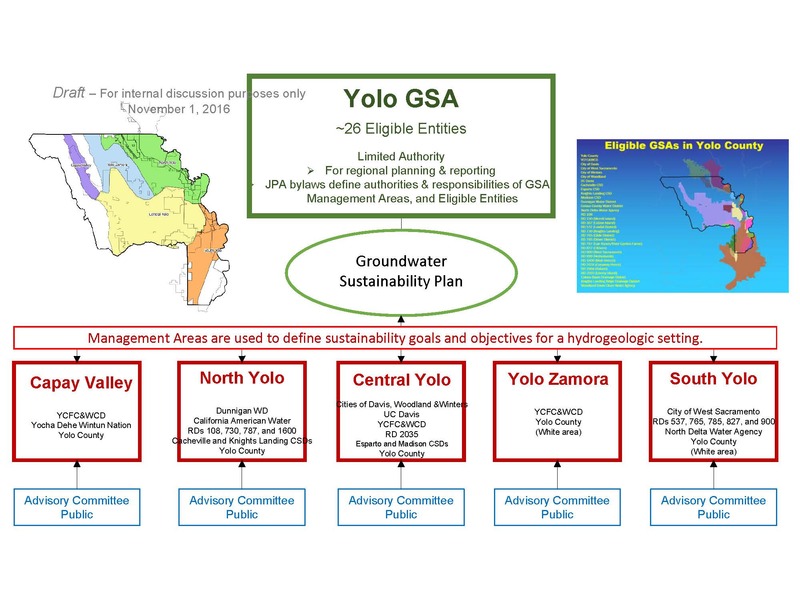 When asked why, they would say, ‘if I’m up in northern Yolo County and I don’t want someone in southern Yolo County telling me to turn on my well or turn off my well.’ So they decided to structure it with the GSA to work on the scale of the region, so they developed a decision tree concept. Mr. O’Halloran said that everybody is going to have to do a water balance, so they are doing it together; they have a grant program with the Stockholm Environmental Institute, they are using the WEAP model, and they have already begun the process of doing the water balances that’ll lead to the decisions. John Woodling, Executive Director of the Regional Water Authority, a coalition of two dozen water purveyors and associated agencies in the greater Sacramento area. He also leads the Sacramento Groundwater Authority which is responsible for sustainably managing the ground water basin in Northern Sacramento County. John Woodling began by saying he would be speaking today primarily as the head of the Sacramento Ground Water Authority. 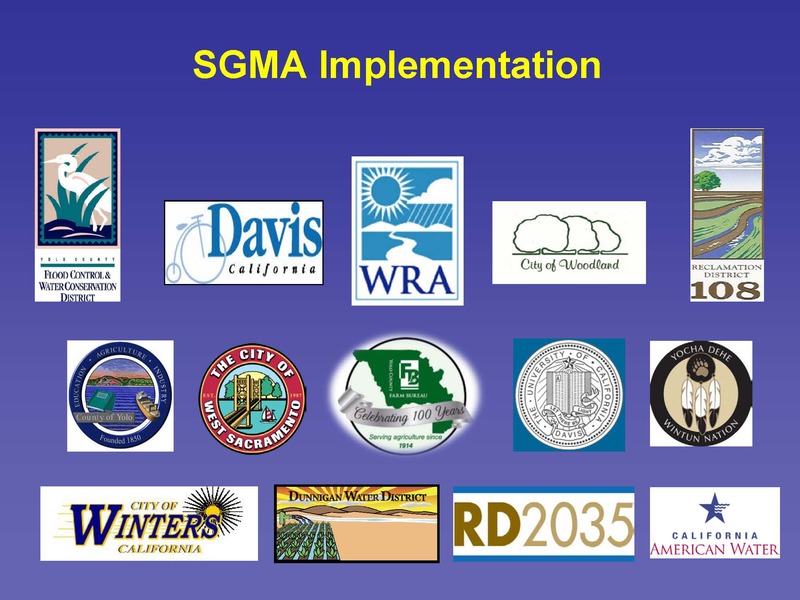 Most of the presentation will be the story of what they’ve done over the past two decades to get things in order, and how their focus on SGMA is to make sure they take advantage of what’s in SGMA to benefit ongoing management while not impeding what they have already done and plan to do in the future. That wasn’t always the case, Mr. Woodling said. Post World War II, the area of Sacramento County was growing and becoming heavily urbanized, and ground water levels were declining. 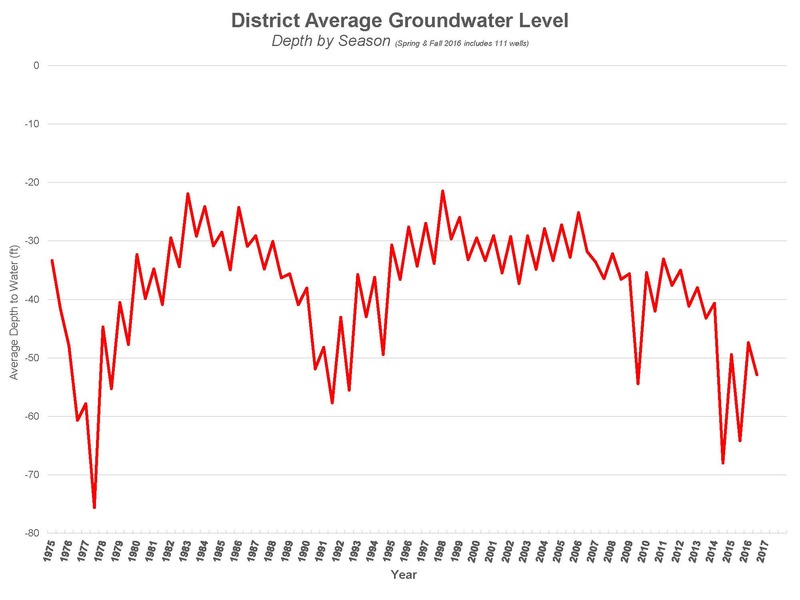 Groundwater levels declined 80 feet from the mid-50s to the early-mid 90s – about two feet per year. Although levels varied over the course of the year, goes up and down over the seasons, but the decline was generally downward. 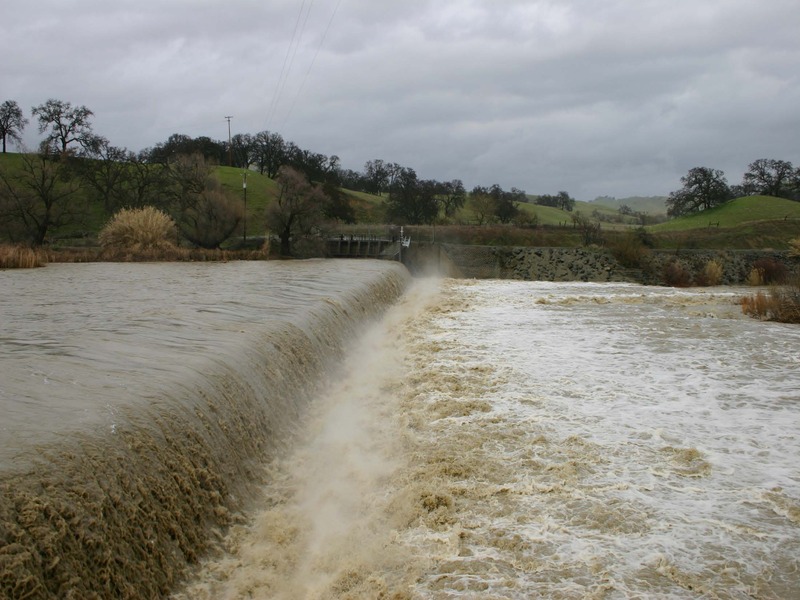 It became clear that changes were needed because in addition to declining water levels, there were major contaminant plumes affecting the ability to use ground water for the municipal supply, as well as a lot of conflict over surface water use and the health of the environment of the lower American River. 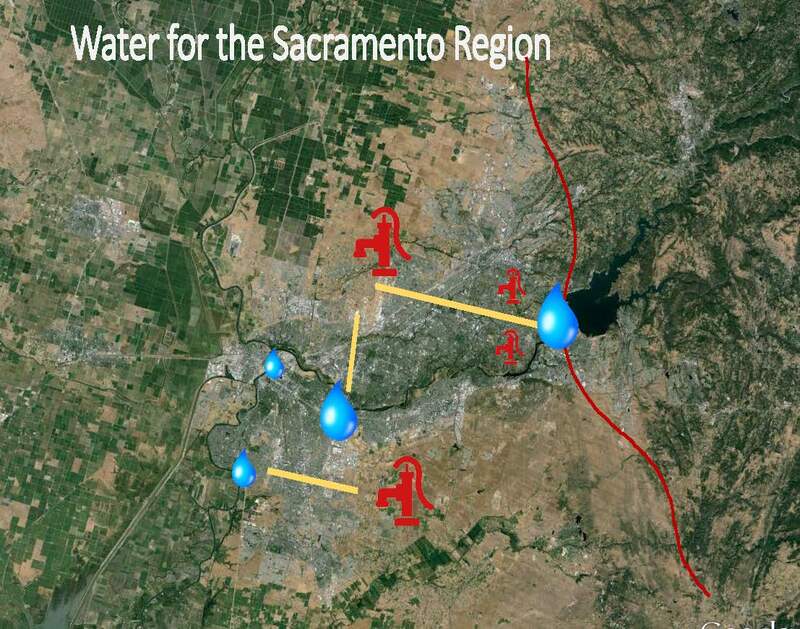 Some areas of the region divert surface water from the American River and the Sacramento River, as represented by the water drops on the map; the pump symbols on the map represent where there was significant groundwater pumping. The red line is the edge of the groundwater basin; to the east, it’s the hard rock of the foothills where there isn’t really sufficient groundwater to supply municipal uses. So one of the first elements was increase the capacity to divert and treat surface water. There are times when there’s abundant surplus surface water available, and they needed to take advantage of those times. 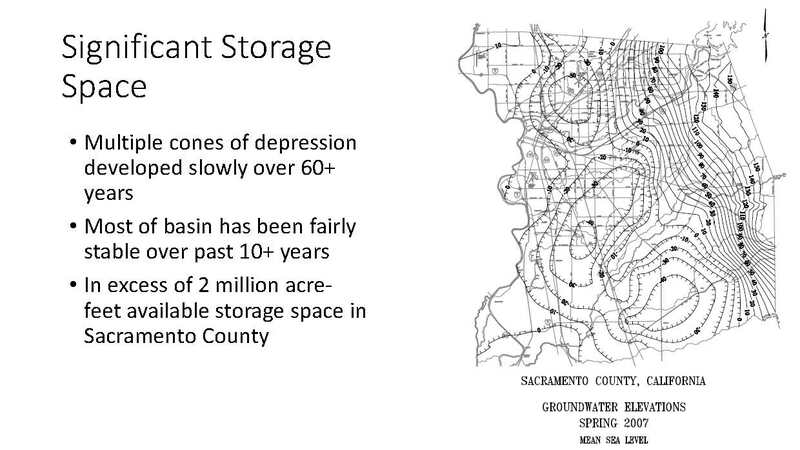 They needed to move that surface water to areas that had been historically 100% dependent on groundwater, those in the center of the basin where the cone of depression was 80 feet deep. 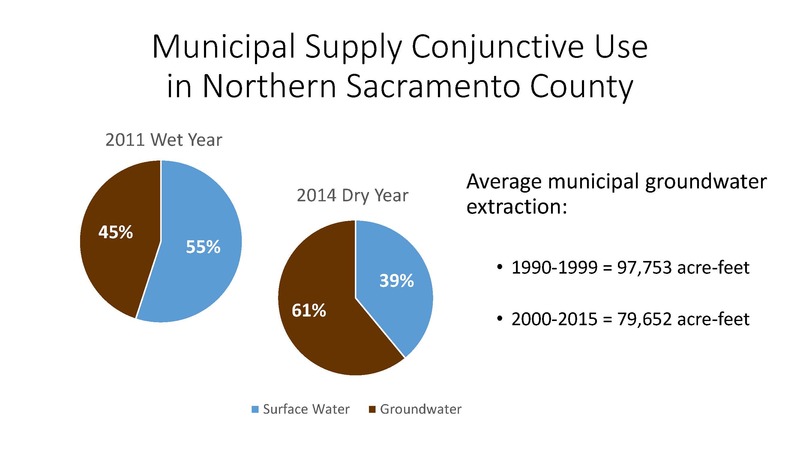 He also noted the Sacramento area is largely an urbanized area for the groundwater pumping and with conservation that’s taken place over time in an area that’s largely built out, the groundwater pumping in the basin has declined on the order of about 20,000 acre-feet, if you look at the average over the 90s and then the average of the 15 years of the new millennium. However, the historic sustainability doesn’t mean they’re out of the woods; there are still a lot of vulnerabilities. Unrelated to the drought, in 2011, the Placer County Water Agency lost a major portion of their water supply because a canal slid down the hill. So they are looking to the future, seeing that vulnerabilities lie ahead, and how can they expand the conjunctive use program to mitigate that. 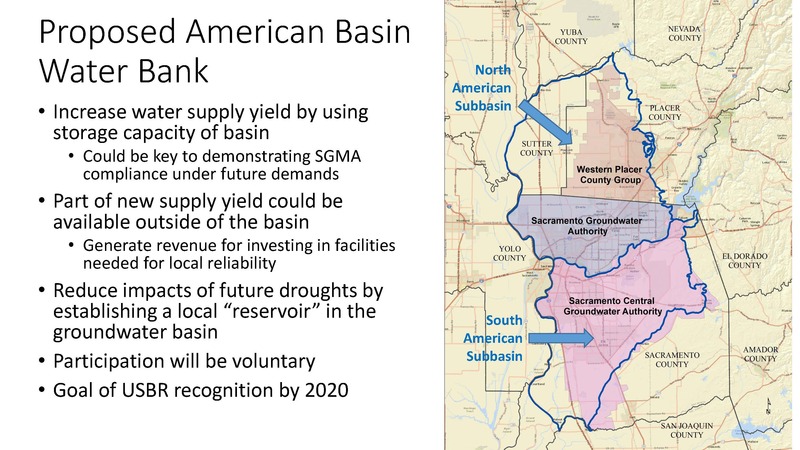 “Going forward, we not only have to worry about our little world in the northern part of Sacramento County, we have to manage with the entire North American sub basin which includes parts of Placer County and Sutter County,” Mr. Woodling said. 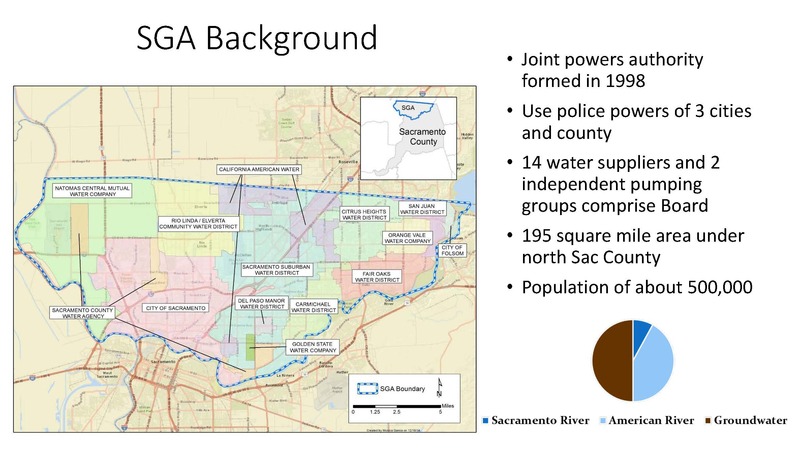 They are forming five groundwater sustainability agencies; the Sacramento Ground Water Authority declared its intent to be a GSA in October of 2015 and others are wrapping up their planning now. Mr. Woodling said it’s true in the other areas of Sacramento and Placer counties. “What we need to do is figure out how to use the surplus surface water which will be coming on a different pattern with climate change, to refill those ground water basins and use those increasingly as our back stop,” he said. Commissioner Orth asked how they continued to engage stakeholders that are not paying a whole lot of attention to this; and also, if there were any storage projects that would assist them. For agenda, meeting materials, and webcast link, click here. For coverage of DWR’s SGMA update, click here.